I hope people realize that this isn’t an act of desperation (although it may be misconstrued as such)… but an act of respect for the fans. If need be, please express that to your European folks and the forums. We have potential partners lined up… but imagine if there is an Ebb fan out there with a new construct that we don’t yet know? Wouldn’t it be foolish not to reach out before we take another avenue? If you get any inquires as to this regard, please let them know that this note was about respecting the fans and so forth. I believe strongly that in this new millennium we are aligned with the fans as partners and including them in our decisions is at the forefront of that world. Thank you for being a supportive and amazing part of the family. I look forward to working with you as we take this to another level. Promises is the first new recording from Nitzer Ebb to be released to the public in more than 13 years and is available only on NCIS: The Official TV Soundtrack. It’s featured in the January 13, 2009 episode of NCIS titled, Broken Bird. CBS Records will release a specially produced soundtrack for the hit television series NCIS on Tuesday, February 10, 2009. NCIS is currently the number 1 TV series in the US with around 20 million viewers per week. Traditionally the Sonic Seducer 2008 Retrospective looks back on the highlights of the past season with new stories and exclusive interviews. As cover story this issue features an exclusive Depeche Mode studio interview. On top, the covermount DVD Boxset is spectacularly filled with 34 tracks: Classics from The Sisters Of Mercy, The Cure (exclusive live), exclusive live videos of Front 242, Apoptygma Berzerk, New Model Army, Unheilig from M’Era Luna Festival 2008, interviews with DAF, Peter Heppner, Anne Clark and clips from ASP, Lacuna Coil, Moonspell, Lacrimosa, Within Temptation, Blutengel, The Retrosic (exclusive preview) and many more – there is a lot to discover! 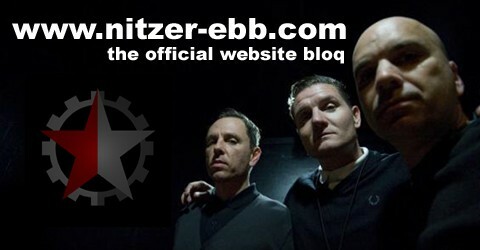 And of course also Nitzer Ebb is featured on the DVD with a video of Let Your Body Learn (live 2008 – exclusive). Also there is a new story about Fixmer/McCarthy inside the magazine.